Have you heard about the Produce for Kids Get Healthy, Give Hope campaign? This is a great program I am thrilled to share with my readers. Produce for Kids® is launching its annual Get Healthy, Give Hope campaign with 16 major supermarket chains across the country, including your local Kroger stores, to help raise money for Texas Children’s Hospital and other local Children’s Miracle Network Hospitals®. Now through July 24th, thanks to the annual Get Healthy, Give Hope campaign hosted by Kroger and Produce for Kids, the more produce shoppers add to their shopping lists the more hope they can give to local children. Celebrating a milestone 10th birthday in 2012, Produce for Kids is excited to kick off this year’s campaign with a new partnership with Sprout® and LazyTownTM. During the campaign, Produce for Kids will offer shoppers collectible Ideal MealsTM – quick and easy healthy meal ideas, which are free and can be found in displays featuring LazyTown characters from the popular, health-focused, children’s series airing exclusively in the U.S. on 24-hour preschool television channel, Sprout. Ideal Meals offer shoppers chef-created/nutritionist-approved easy solutions for breakfast, lunch, dinner and dessert. Featuring fresh fruits and vegetables as the main ingredients, Ideal Meals are great for busy families who crave fast meal options that don’t require stopping at the local drive-thru. Eating as healthy as we should is something I admit we've always struggled with. The reasons are many. Time, finances, picky eaters, turning to convenience foods more often than necessary. I know that when it comes to those of us who extreme coupon, the fact processed foods are often available for next to nothing tends to fill our pantry with items that are not necessarily all that healthy. I am often guilty of opening boxes rather than cooking anymore, which is not an easy thing to admit to for a woman who adores cooking. Ideal Meals comes to the rescue with simple, quick, healthy meal suggestions. Just look for the display at your favorite store! 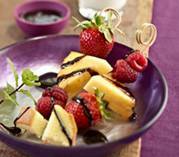 You'll find great ideas, like these Chocolatey Fruit Skewers! Sounds good, right? I love fresh fruit in a dessert, so this recipe greatly appeals to me. Is your favorite store participating in Get Healthy, Give Hope? Check the stores and dates below. Tweeting about the giveaway with a link back to this post and mentioning @ATexasHousewife. Deadline to enter is 11:59pm central time on July 24th. Winner will be selected via random number through Random.org. Be sure you leave one comment for each entry method and that I have a way to contact you should you win. Disclaimer: I received no monetary compensation for this post. I was offered a $25 Kroger gift card, PFK goodies, and Ideal Meals cards. All opinions are 100% my own and are never reviewed or edited in any way by sponsors. The Turkey Burgers & Rainbow Salad looks good! I like Garden Shrimp Scampi recipe. Easy Cheesy Tomato Sandwiches looks delicious! I'd like to try Garden Shrimp Scampi. I like the Turkey Burgers & Rainbow Salad. I'd like to try the Tangy Grilled Chicken. The Garden Shrimp Scampi looks good. I like the Scrambled Waffle-wich recipe. I'd love to try the Garden Shrimp Scampi from the Delectable Dinners section! pineapple pork kabobs recipe sounds good. Tangy Grilled Chicken sounds good. The Rosemary Pork Tenderloin and Roasted Vegetables looks good! I like the Southwest Chicken Wrap recipe! I follow both on Twitter @mgoss123. I would like to try the Early Riser's Pita recipe! Definitely the Pineapple Pork Kebobs! The Oven Baked Onion Rings & Chicken sounds really good! I'd like to try the Garden Shrimp Scampi recipe. I want to try the Steak & Cauliflower Mashed Potatoes. Would like to try the fruit and cream delights! The garden shrimp and scampi looks awesome! I want to try the Beany Pita Power recipe from this group of recipes. The Tangy Grilled Chicken sounds good. Love the recipes, the pictures looks fantabulous! I'd like to try the Veggie-tize Your Omelet recipe. Garden Shrimp Scampi sounds great. Thanks for the giveaway. The Chocolatey Fruit Skewers sound awesome!! I would like to try to make the Southwest Chicken Wraps. I'd like to try the bow ties and veggies recipe. I would like to try the Grilled Veggie Panini recipe. I would like to try the Fruit & Cream Delights. Thanks for the giveaway...we like the Healthy Hearty Beef Stew recipe.